WASHINGTON — Republicans on Sunday celebrated Attorney General William Barr's announcement that that special counsel Robert Mueller did not find evidence to prove criminal collusion between the Trump campaign and Russia, as Democrats raised the volume on demands that the full report be made public. Barr sent a four-page summary of Mueller's report to the leaders of the judiciary committees on Capitol Hill Sunday afternoon outlining the findings of Mueller's two-year investigation, which concluded on Friday. In the letter, Barr said the Mueller report states that the investigation "did not establish that members of the Trump Campaign conspired or coordinated" with Russia. Barr also wrote that he and Deputy Attorney General Rod Rosenstein "have concluded that the evidence developed during the Special Counsel's investigation is not sufficient to establish that the President committed an obstruction-of-justice offense." Still, Barr continued, "while the report does not conclude that the President committed a crime, it does not exonerate him." Congressional Republicans focused on the first part of that statement. "No collusion and no obstruction. The cloud hanging over President Trump has been removed by this report," said Senate Judiciary Committee Chairman Lindsey Graham, R-S.C., who spent the weekend with Trump in Mar-a-Lago, in a statement. "Bad day for those hoping the Mueller investigation would take President Trump down," added Graham, who praised Mueller and his team. Rep. Doug Collins, R-Ga., ranking member on the Judiciary panel, also praised the probe as "long, thorough and conclusive: There was no collusion. There is no constitutional crisis." House Minority Leader Kevin McCarthy, R-Calif., said in a statement, "Democrat leaders acted irresponsibly and threw caution to the wind to damage and distract from the work the Trump administration is doing on behalf of our fellow citizens. While this conclusion is an embarrassment to those Democrats, it is more discouraging to think of the opportunity costs to our country." Rep. Mark Meadows, R-N.C., a staunch defender of the president and former chairman of the Freedom Caucus, said the release of Barr's summary marked a sort of closing bell. "After 22 months of a special counsel and 2 years of congressional investigations, it's over. The clock has finally struck midnight on the 'Russian collusion' fantasy. No collusion." The probe, which was launched in May 2017, employed 19 lawyers with the assistance of 40 FBI agents, intelligence analysts, forensic accountants, and other professional staff. Barr said that Mueller issued more than 2,800 subpoenas, executed nearly 500 search warrants, obtained more than 230 orders for communication records and made requests to 13 foreign governments for evidence, the summary said. Hill Democrats on Sunday reiterated their calls for the public release of Mueller's report and the underlying documents. On Twitter, House Judiciary Committee Chairman Jerry Nadler, D-N.Y., highlighted the line in the summary that said the report "does not exonerate" Trump. In a follow-up tweet, Nadler said that he'd like Barr to testify before Congress. "In light of the very concerning discrepancies and final decision making at the Justice Department following the Special Counsel report, where Mueller did not exonerate the President, we will be calling Attorney General Barr in to testify before @HouseJudiciary in the near future," he said. 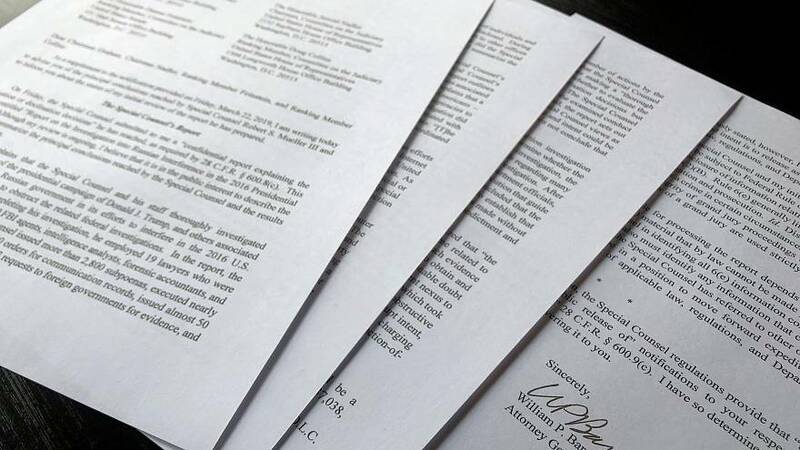 Rep. Bill Pascrell, D-N.J., tweeted that Barr's letter "leaves more questions than answers. A sanitized summary from Trump's handpicked bodyguard is not acceptable. Barr has his finger on the scale to protect Trump. The full report should be released immediately." Rep. Chellie Pingree, D-Maine, said the summary was nowhere near enough. "Congress voted overwhelmingly to release the#Mueller report. We should expect no less than the full report," she tweeted. "AG Barr's summary further confirms the need for Congress to see Mueller's underlying documents, so we can continue our investigations & uncover the truth for the American public," Rep. Sean Patrick Maloney, D-N.Y., said on Twitter. Speaker Nancy Pelosi, D-Calif., told House Democrats during a Saturday conference call that she would reject any classified briefing offered to top congressional leaders, reiterating that any briefing must be unclassified. Members of Congress are scheduled to return to Washington on Monday following a week-long recess. All eyes will be on Capitol Hill, where key oversight committees plan to scrutinize Mueller's findings.